"We make money the old fashioned way. We print it."  Art Rolnick, Chief Economist for the Minneapolis Federal Reserve Bank The $700 billion that was arm-twisted from Congress by Treasury Secretary Hank Paulson in October was evidently just the camel's nose under the tent. According to a November 24 Bloomberg report, the Paulson/Bernanke team is now prepared to pay $7.76 trillion to rescue the financial system. Prepared to pay how? Congress has not raised its debt ceiling to anywhere near that level; but the approval of Congress, which originally voted down the controversial $700 billion bailout, is apparently no longer necessary. The door has been opened, and the Treasury Secretary and Fed Chairman feel they can now pledge whatever they want. Perhaps they are inching up a zero at a time just to see what the public's tolerance is for unrepayable debt. The new sum  $7.76 trillion  represents $25,000 for every citizen in the country, or half the value of everything produced in the nation last year; yet it's not clear that a mere half of our net worth will rescue the financial system. One bankrupt bank after another has been bailed out with public money, in a futile effort to prevent a collapse of a massive multi-trillion dollar derivatives pyramid created by the banks. But according to the Comptroller of the Currency, U.S. commercial banks now carry over $180 trillion in derivatives on their books. The public is liable to be bankrupted before this mess is resolved. On top of the $700 billion initially extorted from Congress, an additional $2 trillion in loans and commitments has already been made by the Federal Reserve and the Treasury. Yet that wall of money has not kept the imperiled banks from collapsing. Citigroup was one of the nine lucky recipients of Paulson's largesse in October, when he set out to recapitalize the banks by trading dollars for shares. The bank received $25 billion from the Treasury; yet this handout was insufficient to keep its stock from dropping below $4 a share. Citigroup was then bailed out by the Treasury to the tune of another $20 billion, along with a commitment to guarantee $306 billion in toxic assets on its books. That equals half the $700 billion bailout, just for one bank; yet Citigroup's books, which sport derivative bets of $37 trillion, won't look much better than before. Meanwhile, commentators are scratching their heads over where the money is supposed to come from to pay for all this. Congress hasn't approved these multi-trillion dollar sums, and the Federal Reserve doesn't show them on its books. Some clues to this mystery came on November 25, when according to The New York Times: "In the first of two new actions . . . , the Treasury and the Fed said they would create a $200 billion program to lend money against securities backed by car loans, student loans, credit card debt and even small-business loans. The Treasury would contribute $20 billion to the so-called Term Asset-Backed Securities Loan Facility and assume responsibility for any losses up to $20 billion. The Federal Reserve would lend the new entity as much as $180 billion. The new facility would then lend money at low rates to companies that post collateral based on securities backed by consumer debt or business loans." It appears that the $20 billion in Treasury money will be serving as the "reserves" to create $200 billion in credit on the books of the Fed and its network of banks. Ten to one is the reserve requirement established by the Federal Reserve for private bank lending under the "fractional reserve" system. The New York Fed has now deleted its earlier discussion of this process from its website, but as it explained the money-creating process in 2004: "Reserve requirements . . . are computed as percentages of deposits that banks must hold as vault cash or on deposit at a Federal Reserve Bank. . . . As of June 2004, the reserve requirement was 10% on transaction deposits [deposits immediately available to depositors]. . . . If the reserve requirement is 10%, for example, a bank that receives a $100 deposit may lend out $90 of that deposit. If the borrower then writes a check to someone who deposits the $90, the bank receiving that deposit can lend out $81. As the process continues, the banking system can expand the initial deposit of $100 into a maximum of $1,000 of money ($100+$90+81+$72.90+ . . . =$1,000)." In a revealing booklet called "Modern Money Mechanics," the Chicago Federal Reserve detailed how fractional reserve lending allows money to "expand." The booklet is now out of print, perhaps because it revealed too much; but it is still available on the Internet. 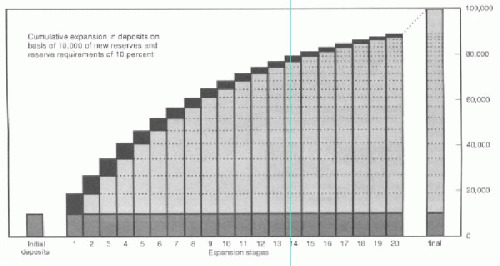 On page 11 of the booklet is a helpful chart showing that the original deposit is not actually "lent" but remains in the bank throughout the expansion process. What is lent is an additional sum created on the bank's books valued at 90 percent of the original deposit. Then another sum is lent that is 90 percent of the second deposit, and so forth, until the total sum generated is 10 times the original deposit, with tidy sums collected in interest at each step along the way. The November 25 New York Times article continued: "The Treasury secretary, Henry M. Paulson Jr., made it clear that the new lending facility was just a 'starting point' and could be expanded to many other kinds of debt, like commercial mortgage-backed securities. . . . It was the first time that the Fed and the Treasury have stepped in to finance consumer debt. The $200 billion program comes close to being a government bank." A government bank that makes credit available to all qualified borrowers is not a bad idea. It would seem to be a more useful idea than manipulating interest rates, the conventional tool used by the Federal Reserve to regulate the money supply. When Paul Volcker raised interest rates to 20% in 1980, he bankrupted much of the Third World; and when Alan Greenspan lowered the short-term interest rate to 1% in 2001, he precipitated the housing and derivatives bubbles that are bankrupting the U.S. today. A government-owned bank that put credit into the economy in an open, accountable and impartial way could be just what the doctor ordered. The problem is, the Federal Reserve isn't government-owned (it is owned by a consortium of private banks ); and it is not distributing the public credit openly and impartially. The Fed has kept the recipients of its largesse largely secret (something Bloomberg News is currently suing about under the Freedom of Information Act ). However, it is clearly favoring its banking cronies over consumers. Note that the "consumer debt" the Fed is now supposedly financing does not consist of loans directly to consumers. The loans are to lenders holding consumer debt ("companies that post collateral based on securities backed by consumer debt or business loans"). Like with subprime mortgages, lenders have pushed credit cards and student loans onto anyone who would take them, because the lenders had no intention of keeping those risky loans on their books. They intended to package them up as "securities" and sell them to investors. But the investors are catching onto this scam and are no longer buying; so the Fed is stepping in to underwrite the debt, advancing "credit" created on its books with accounting entries. When these loans are not paid back, we the taxpayers pick up the tab, either directly or through the "hidden tax" of inflation. The benefit goes to the lenders, who get off scot-free for their risky ventures, while the people bear the risk and pick up the losses. If these investments are too risky for investors, they should also be too risky for the "government bank." We don't need more consumer debt to keep the economy going. We need more wages and salaries, and that means more jobs. Rather than propping up the "finance" industry (the business of money making money), the Fed should be furnishing low-interest loans directly to businesses, state and local governments and other qualified members of the producing economy. Watching the Paulson/Bernanke bailout scenario unfold is a bit like watching the end of the Charlton Heston movie El Cid, where the Spaniards prop up their dead general on his horse and charge the Moors, giving the illusion that the champion is still alive and leading them. In this case, what they are propping up are not national heroes but banking pretenders who are not only unnecessary but have established their incompetence at managing the banking business. Congress could avoid this costly masquerade by either nationalizing the Federal Reserve or setting up its own publicly-owned lending facility, one that created credit on its books just as private banks do now and made it available openly, impartially, and at modest interest rates to all qualified borrowers. Unqualified borrowers should be denied, and that includes insolvent private banks, which should be put into FDIC receivership, had their books washed clean in bankruptcy, and reorganized as truly "national" banks advancing the "full faith and credit of the United States" for the benefit of the people of the United States. 1. Mark Pittman, Bob Ivry, "U.S. Pledges $7.7 Trillion to Ease Frozen Credit," Bloomberg.com (November 25, 2008). 2. See Ellen Brown, "It's the Derivatives, Stupid! Why Fannie, Freddie and AIG All Had to Be Bailed Out," www.webofdebt.com (September 18, 2008). 3 Edmund Andrews, "U.S. Details $800 Billion Loan Plans," New York Times (November 26, 2008). 4. Federal Reserve Bank of New York, "Reserve Requirements," www.ny.frb.org/aboutthefed/fedpoint/fed45.html (June 2004). 5. See Ellen Brown, "The Fed Now Owns the World's Largest Insurance Company  But Who Owns the Fed? ", www.webofdebt.com (October 7, 2008). 6. Mark Pittman, et al., "Fed Denies Transparency Aim in Refusal to Disclose," Bloomberg.com (November 10, 2008).